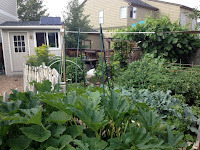 In the past I’ve used both drip irrigation systems and regular soaker hoses in my gardens. The drip systems were nice but a lot of work to put together, and the laser-cut hoses I preferred sometimes got plugged with sand and dirt. 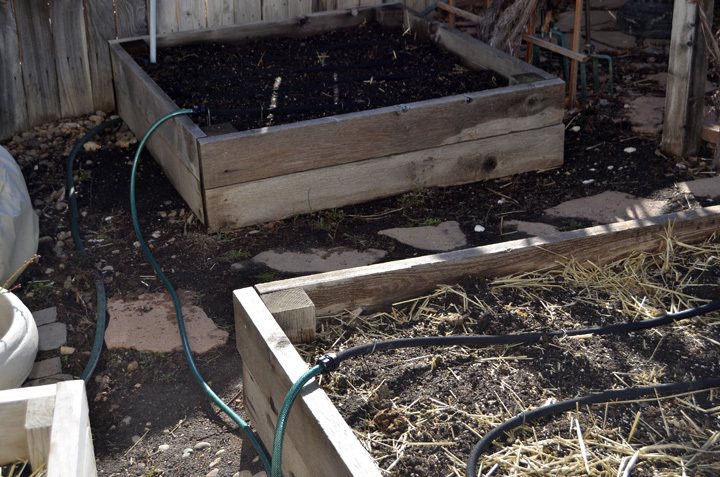 The soaker hoses worked well too, but as I have several raised beds there was always the issue of watering the ground between the beds—not only wasting water but I was making life too comfortable for the weeds. Then I saw Snip n Drip in a Gardener’s Supply catalog last summer. 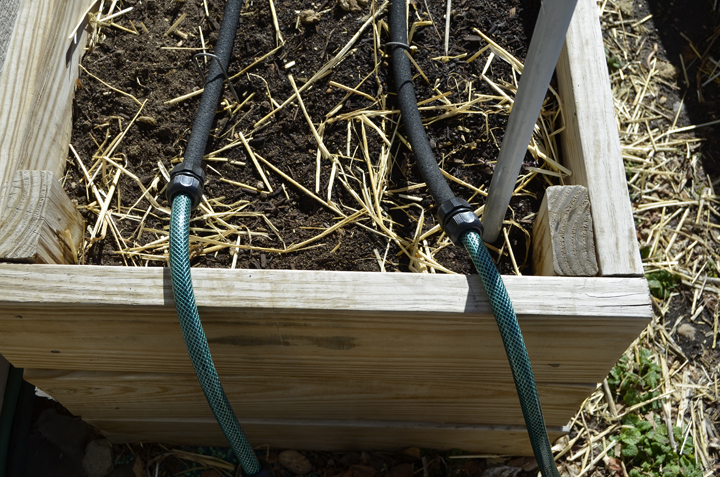 It seemed like the perfect solution: soaker hoses for the areas where you need them, but with PVC garden hose that you could snip and connect to the soakers for between beds. I was so excited I bought a couple of sets last fall, which gave me 100′ of 1/2″ soaker hose, 50′ of garden hose, 16 hose couplers and two ends. Fast forward to the spring of 2013. 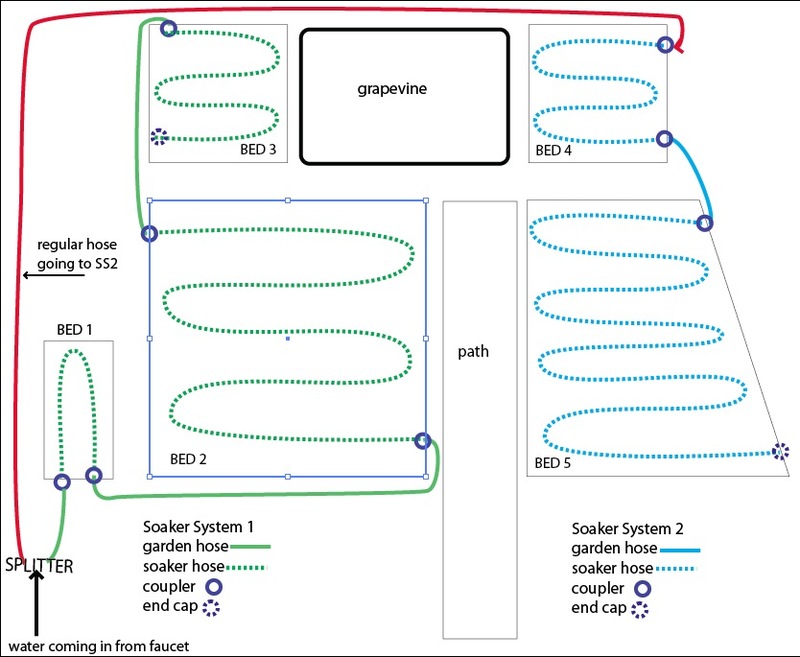 I drew a map of my garden, measuring the beds and the space I would need to run hose between them. I put my drawing into Adobe Illustrator (not necessary but it’s the way I function) and played around with different patterns for the soaker hoses to be laid. Once that was done, I went to work in the garden. I let the hoses sit in the sun for a while to soften the plastic and got down to cutting the hose and soaker hose with kitchen scissors as I went along, attaching the couplers as well. I was amazed at how easy it was! I didn’t struggle with the couplers going on the hoses or tightening the caps, even though I have some arthritis in my hands. I used landscaping pins to hold the hoses in place. I got about half way through the last bed and ran out of soaker hose! I had an old soaker hose that I’d bought at Walmart a coupler of years back, and was pleased to find that it was the same size as the Snip n Drip soaker. That allowed me to finish the rest of the bed that day. I have a final 4’x4′ bed, but it turned out the water just couldn’t reach that far so I ended up doing something else there. We have a faucet just outside the garden so I attached a hose splitter to it. On one side I put a timer and the other side a regular hose in case I ever need to use one. I ran a short hose from the timer into the garden and on the end of that attached yet another hose splitter. Soaker system 1 is attached to this splitter, the Soaker system 2 is attached to another short hose I ran to the other side of the garden. That way half of the garden would be on one soaker and the other half on another, so the water didn’t have to travel over 200′ to get to the end. 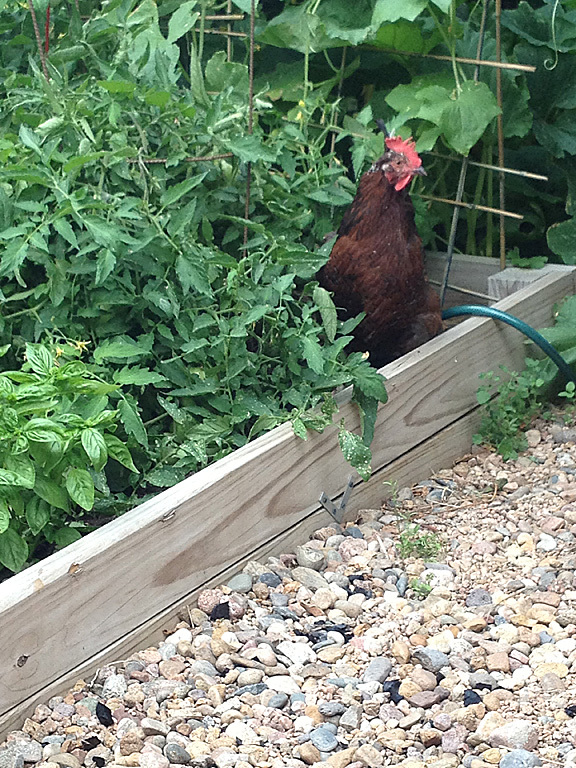 At planting time I positioned my plants and/or seeds directly under the soakers. I set the timer to water 30 minutes every morning. It’s now early September, so we’ve gone through the entire summer using the Snip n Drip soaker. It was a complete success! 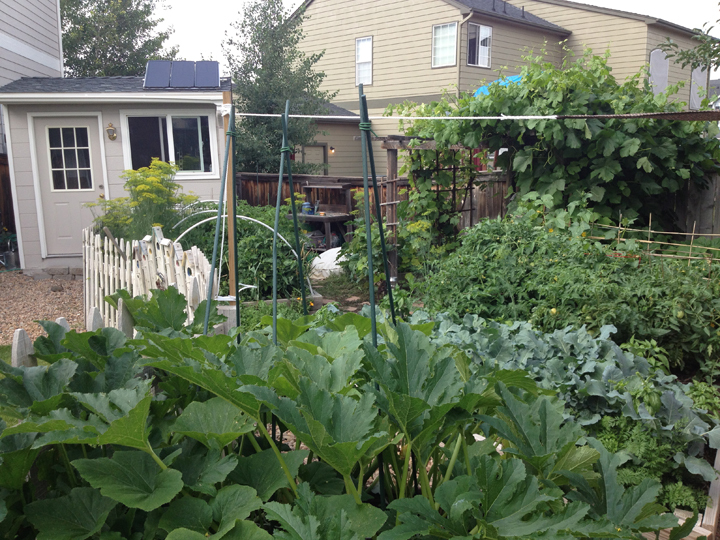 Even being gone on vacation for two weeks, the garden never dried out. I have more vegetables than I can handle! 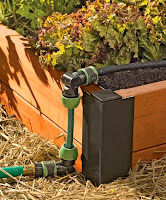 The only thing I would change in the future is to switch some of the connectors to their new Raised Bed couplers (90° angle couplers), because the hose curving up and over the edge of my raised beds tends to flatten out. They don’t sell these couplers individually (like they do with the original ones) and I really don’t want to buy the whole setup again. 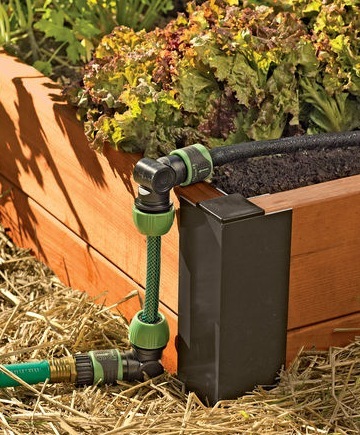 They also unfortunately only have two raised bed couplers per package (as opposed to the 8 in their standard setup), and I would need 8 for my garden. Yikes! 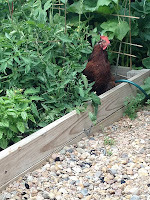 I’ve emailed them to find out if they plan on selling those raised bed couplers individually in the future. They wrote back saying that at this time they are not offering that option, but will forward my request to their buyers in the hope they’ll comply at some point. For now, I’ll have to come up with some clever way to keep those hoses from pinching themselves off! 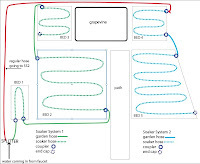 This entry was posted in gardening in colorado, save water, snip n drip, soaker garden watering system, soaker hoses, water saving garden techniques on September 3, 2013 by Farmer Deb.